Augmented reality games are still yet to become mainstream and have a lot of potential still; however, there are already quite a few great AR games available on the Google Play Store which truely show how great AR games can be when created right. There are various different kinds of AR games all of which are great in their own way but picking the best AR games from the Google Play Store can be a bit tricky since most AR games on the Play Store aren’t really all that good and you’d have to spend more than a couple hours trying to find the best AR games. To make things easier, we’ve curated a list of the best-augmented reality games currently available on Android. So here are the top AR games for Android as of now in no particular order. Pokemon Go was the game that really brought forward AR games on smartphones to the masses. The game is one of the largest AR games currently available on mobile and had garnered a massive user base right when it launched on Android and iOS. You need to head out in the real world and battle against others and catch Pokemon as well. There’s almost every Pokemon you could think of and the game lets you have epic GYM battles as well. If you grew up watching Pokemon or are just looking for a great AR game to play, then Pokemon Go is definitely worth checking out. Stack it is a super fun and casual game and could be played anywhere as a quick and entertaining way to kill time. The game is extremely simple and basically, all you need to do is stack as many blocks as you can on top of each other perfectly to build the tallest AR tower you possibly could. 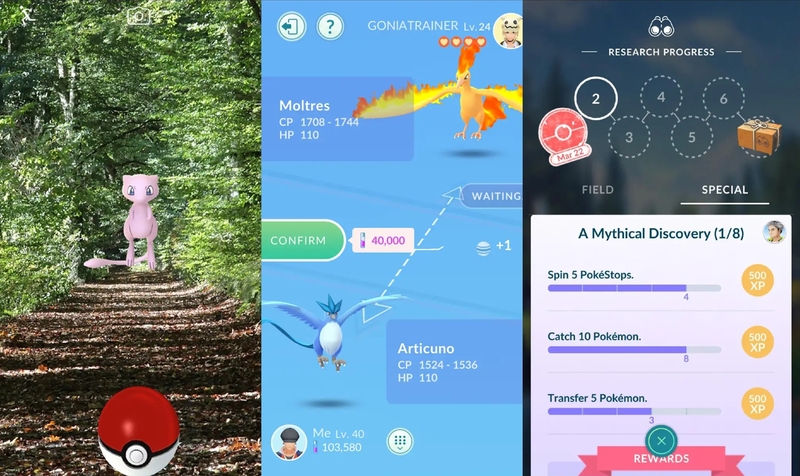 The game is developed by Niantic, who have also developed Pokemon Go. You need to head out into the real world and link your team’s Portals and creating Control Fields to prevent enemy teams from doing so. The game also lets you plan strategies with real people around you who play the game as well as others from around the world. If you’re not much big of a Pokemon fan, then Ingress is a great alternative to Pokemon Go and is also one of the best AR games currently available on Android. 13 Best AR Android Apps you should try! 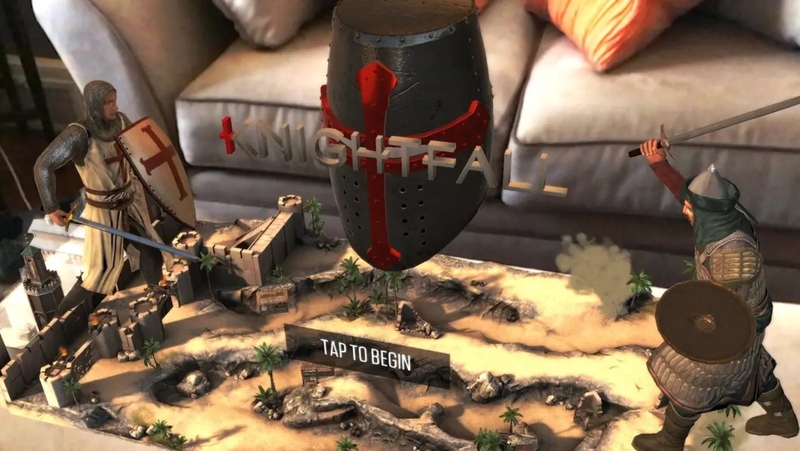 Knightfall AR is one of the better AR games for smartphones. Simply set up the game on your table or any flat surface and begin defending your city against enemy Mamluk warriors who would try to breach the walls of your city. You could even zoom in and out and get up close and personal to the action in the game. Strengthen your defenses by upgrading them as you go along to make sure the enemies do not breach the city walls. ARrrrrgh makes use of the Unity and ARCore and is a fairly new game. The game takes a spin of the classic hide-n-seek game probably all of us have played. The game lets you turn your surroundings into a hiding ground where you need to hide the treasure in the floor and then hand your phone over to the other player for them to find and dig up the treasure with a shovel. The game’s concept is pretty good and does show a lot of potential, unfortunately, there are still a few issues and the game might not work on your device. Nevertheless, when the game does work, it’s quite fun and is definitely worth checking out. Brickscape is one of the only good AR puzzle games available on Android currently. You need to move the various blocks inside the square and the main objective is to move the main square in the center. It might seem pretty simple; however, the game is fairly challenging and you could play the game in AR mode as well as with the AR mode. There are only a few AR games in the Google Play Store and Slingshot is easily one of the best and most entertaining AR games to get your hands on. You’ve been asked by your king to hunt down the terrible dragon and destroy its eggs which are hidden in castles. You need to sling projectiles at the castles to destroy them as well as the dragon eggs. You could move around and find the best angle to attack the castle and there are a dozen projectiles to choose from such as small and large boulders, bombs, missiles, cluster bombs, and parachute bombs. Now here’s a game that would get you moving about like Pokemon Go and Ingress although the game isn’t as advanced as either. The game is perfect for those who like mystery and you could play the game in two different modes; Indoor mode and Outdoor mode. You need to pick between two roles; Treasure protector or the Hunter. As a protector you’d have to lay down the trails to the treasure while as the hunter you need to follow the trails to the treasure. The guardians in the game are Indian mythological characters. If you’re not a big fan of adventure and puzzle games, then Army of Robots is just the game you need to try out. The game is fairly easy to understand. You need to defend yourself from enemy robots trying to invade your surroundings. The game is fairly engaging since you have to move around to dodge enemy projectiles. All you need to do is take out the enemy robots to secure your surroundings. While the game is quite fun, at times the game is unable to detect the surroundings and the floor hence it might not work. Be sure to play the game in a well-lit area. 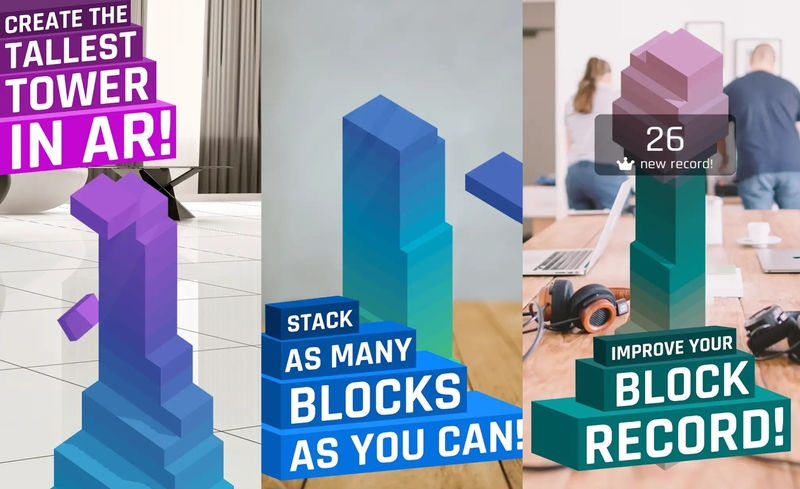 WobblyStack is a super fun AR game which is basically an augmented reality version of Jenga. The graphics are quite good and the game is as simple as it could be. Simply twist, pull and push the Blocks to build the stack higher and higher without it falling. If you’ve ever played Jenga then you’d be familiar with the game already. What’s even better is the fact that the game offers haptic feedback when trying to push and pull the blocks out of the stack. Zombies, Run! is not the kind of Zombie game you’re probably expecting. The game is geared towards being a fitness game rather than an entertainment game. You need to head out or even run on a treadmill to unlock further pieces to the story. This, in turn, keeps you in shape as it provides some motivation for you to workout. While the game itself is pretty good, there are chances that players might lose interest over time. AR Smash Tanks! is another cool game which isn’t your typical AR puzzle game. You basically need to destroy enemy tanks which can be played out on your table. The game also lets you play with friends via 1 or 2 devices multiplayer mode. The game is a paid game which means there are no pesky in-game ads or loot boxes. Simply fire weapons and fling your tanks at other enemy tanks to win the game. Sharks in the Park is a game that’s still in testing; however, you could still play the game normally. The game is targeted towards children in an effort to make them play out of the house. Your child would not be able to play the game indoors since the game requires there to be a sky and also relies on GPS to make sure the device isn’t indoors. The faster you move in real life the faster you would move in the game as well which means your child would be working up a sweat within no time. So if you’re unable to convince your kids to play outside, then we’d suggest asking them to play this cool game. While this isn’t actually a ‘game’, you could still have fun with friends and even discover other messages by users of the application. 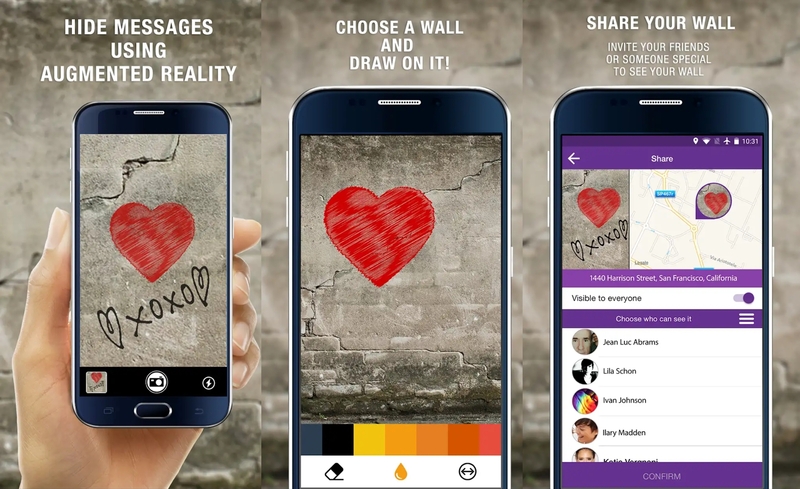 The concept of the app is quite simple, all you need to do is point your phone at a wall or surface and doodle about or add text or images. You then have the option to leave the message private or public which can be seen by anyone who uses the app when they open up the app and point at the same location. The application comes with a bunch of features and you could also come with your own creative games with the app. The best part is that there are no charges for using the app and there are no pesky ads as well. 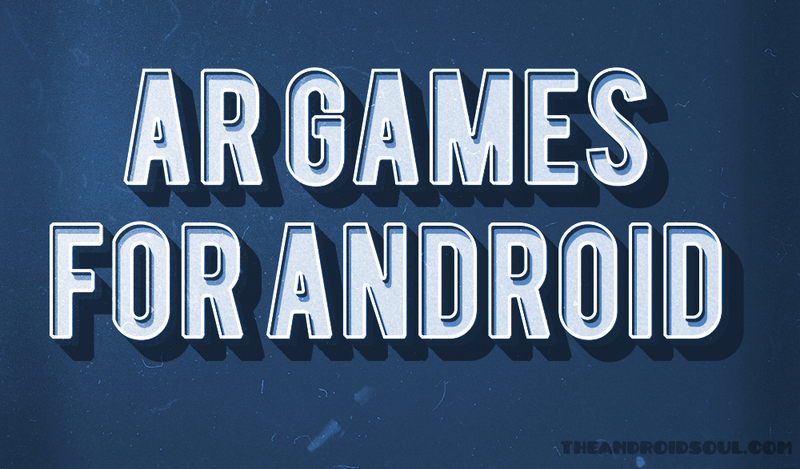 What’s your favorite augmented reality game on Android? Let us know in the comments below.